This. is. it. Breaking open these faux fish fillets and taking a bite of crispy, perfectly seasoned breading along with some steaming nori-laced tofu inside made all of my deep-fried dreams come true. Even my husband, who is a die-hard fried fish connoisseur, loved these. This pairs perfectly with homemade russet potato chips, malted vinegar and a squirt of fresh lemon. In a medium-sized bowl, mix together the flour, cornstarch and seasonings. Slowly pour in the beer and mix the batter until there are no lumps left. Place in the refrigerator for about three hours. When you are ready to prepare the dish, start by heating plenty of oil in a small saucepan over medium high heat. While you are waiting for the oil to heat, slice the potato into thin slices on a mandoline slicer. Test the readiness of the oil by inserting a potato slice into the oil halfway with heat-resistant tongs. If it immediately bubbles up around the potato, you are ready to fry. Working in batches, slowly slide about 10 slices (one at a time) of the potato into the hot oil. Fry until golden, about 5 minutes. Remove the potatoes from the oil with heat-resistant tongs and let drain on paper towels, sprinkling with a little salt. Set aside. To make the faux fish filets, work with the tofu one piece at a time, dunking it first into the Ener-G/nori mixture, then dunking it into the batter, coating well. Transfer it immediately into the hot oil and fry until golden brown, about 2-3 minutes. Remove carefully from the oil with heat-resistant tongs and place on paper towels to drain. Serve with the potato slices, lemon wedges and malt vinegar or vegan tartar sauce, which can be made by mixing equal parts relish and Vegenaise together. Any leftover batter can be refrigerated for an extra day or frozen for up to three months and reused. Amazing! That sounds like an incredible recipe. I must try! Beautiful presentation, too. Ahhh, give it to me! Wow! That looks amazing. Next time I'm feeling like frying something, it'll definitely be this. The picture had me! I don't miss much as a vegan, but a good fish & chips is one of the few exceptions. Really looking forward to trying this! Wow, this is a gorgeous post and an impressive recipe! You do MoFo up right! Can't wait to try the "fish"! these are things of beauty! This looks fantastic. I think I'm going to try it for dinner tomorrow. What texture tofu did you use? this looks unbelievably good. putting on my mofo must-make list for sure! oh my deep fried goodness. love it! The breading on the faux fish looks perfect. I really need to try this! This blows my mind! I never liked fish but my husband loves the battered stuff, I seriously need to try this. Oh I wish I could smell this. the faux fish looks awesome. This looks so good! I can't have beer due to having celiacs. Do you recommend anything to replace that with? Anonymous – I think you may be able to sub 10 ounces of soy/rice milk with 1 TB of apple cider vinegar here — good luck! My hubby was just telling me the other day how much he misses fish and chips. 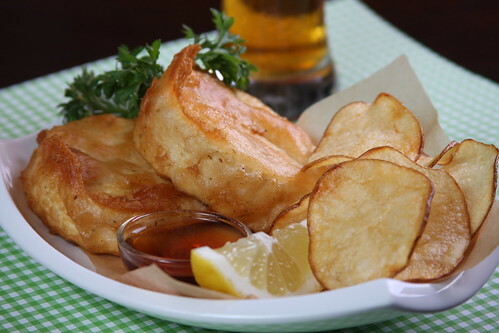 I have seen a few faux fish and chips recipes but yours looks superior. Bookmarked! Wow! I have missed fish & chips. They were a favourite when I lived in England. I would love to try this! I have to try this! It looks sooo good! The fish looks amazing!! Has the tofu been pressed?? Anonymous – no, there is no need to press the tofu for this method. This looks absolutely stunning, well done! But I can't guarantee success, as I've never tried them. You can also just leave it out, but it may result in the batter sticking too fast to the tofu, so instead of being fluffy, it may be more dense. Good luck! Yet another delicious dish from your website! My hubby says that it's the best thing I've made to date! He's allergic to soy, though, so he can only enjoy small tastes of mine…more for me!!! There is lots of batter left over, so I'm frying zucchini. Great batter! Thank you for this recipe! yay! so glad you and your hubby enjoyed! Isn't beer batter the best? Yes, It was hard to wait 3 hours to use it! Made this dish last night and it was amazing. My husband said it's his new favorite dish. However, I had a heck of a time trying to grind the nori sheet into powder. Would Kelp Flakes work? Also your photos are always amazing. Thank you for all your recipes. Jan, so happy to hear that! Kelp granules would work here, although they may be a little crunchy. I use a coffee grinder to grind the nori into a powder. Thanks again for your kind words!